Discussion in 'Amplifiers' started by WeFixFlats, Jun 1, 2017. I've never played a DG amp. Me either. We should do something about that. Hey, Flats. Can Bodia and I come over to play?! After watching that video again, and Mrs. B going to the grocery store, I had to turn up the SuperD with Mr. Clean...and the Reclaimed Vela...and Cu24...and Les Paul...for about an hour. The neighbors across the street gave me the thumbs-up, then left the neighborhood. I'd love a comparison play-date. I also play a small venue next weekend, which sounds like the perfect place to take the 2x12 and practice what I preach. That video slays me. Great player, great amp and guitar, great tone all around. It does sound exactly like the amp sounds in person, if set up the way Grissom does it. I was there, I got to hear it in person. Update: After the initial "Holy Smoke what an amp~! "...we did further listening tests. First off, this amp should be 'high fidelity/recording studio' with no 'normal distortion'. Well as I began to listen very closely there was abnormal audio distortion. The problem was heard when doing 'double stops' high on the neck(10th fret and above) on the D and G strings by the way. So, what's the action plan? I replaced, all at once(shotgun method) the four preamp tubes(V1,V2,V3,V4,(ECC83S,ECC81,ECC83S,ECC83S) RIGHT to LEFT (V1 is closest to the input jack) as described in the Sewell Technical Notes with 'known good' spares=No Change. Further reading in the notes, the recommended power tube replacements are: Sovtek EL34M. (Did confirm with David Grissom, himself,via a text message he uses these in his live rig). And not the ones that came originally installed from PRS in my head=6P14P-EV/7189. The last bias readings I measured from these, left to right were: 38/38/36/38. Rather than order the same model power tubes, from an unknown vendor on eBay, I ordered four(4) of the Sovtek EL34M's from The Tube Depot, 'no burn in, no matching' to save time and money. 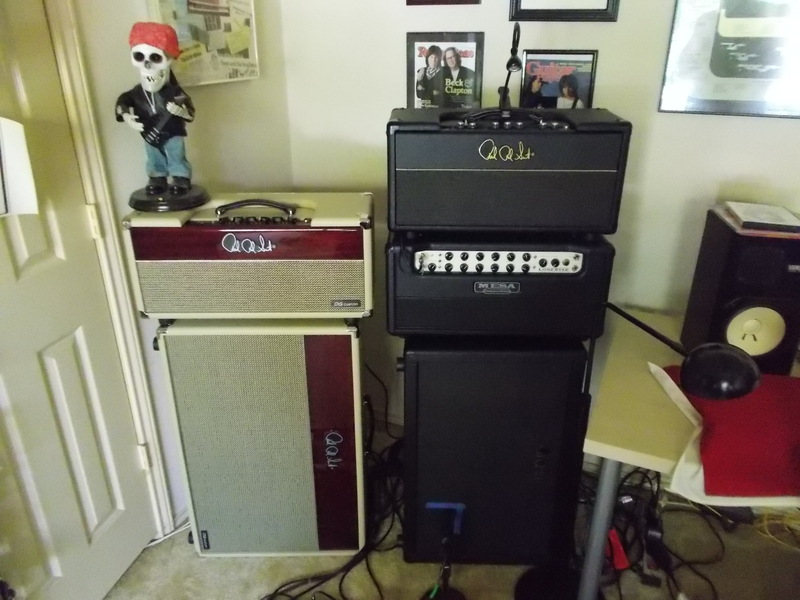 Installed those, today, and let the amp warm up for 15 minutes, new bias readings from left to right: 35/36/35/36. Nominal is: +/- 35. Next the 'audio' test. Well, well, well, no audio distortion==High Fidelity Achieved~!. Final test was to use the "Les settings". Boom Goes The Dynamite~!!! Now THIS is the real deal. I hope this information will be helpful to anyone considering buying this amp and learn from my experience. Excellent post - glad you dug the settings!! Boogie, bodia, FJ4 and 1 other person like this. That's some juicy goodness right there! Looks like "Brothers in Amps" to me. If that room isn't 60'x40', there's a whole lotta deafness going on in there! But it's gorgeous. Yup, provided that you set your guitar a certain way. Grissom doesn't like much treble, and if you look at his guitar tone control setting, it's 0. I like a bit more treble, so in my studio I generally use the bright switch on, set the amp the way Grissom does, except I set the treble around 6. Also I run the guitar pickup volume control around 6-7, and the guitar tone control between 6-9. One thing about the amp is that it really sounds its best with the Master wide open, unless the gain is up to 7-8. At that point the Master doesn't kill the tone. Also my room isn't bright sounding; I have sound absorption. In a brighter room, I'd probably switch off the bright control and reduce the treble as well. After experimenting around, there is one modification/customize change I'd make to this amp. A single two button footswitch that would turn both the Reverb and Clean/Boost features on and/or off. That way you could select either the internal Reverb tank or use a pedalboard Reverb effect. And the same with the Boost feature, so you can switch between 'Clean or Boost' on the fly. I'd imagine those would be desirable features for a number of players. Doug Sewell and team might be willing/able to do the mods; it'd be worth contacting them to find out if they're possible. I'd imagine the reverb tank would be pretty easy, but the boost might not -- I'm not sure it's a typical boost circuit.